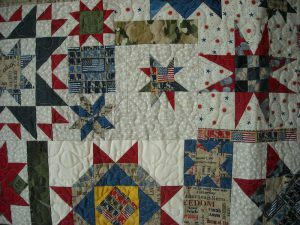 Back at the beginning of this year, Moda put out a call for folks to make quilts for their Piece and Comfort Challenge. My local quilt shop, Sew Sweet Quilt Shop, in Brunswick, MO, was participating, so I decided I wanted to enter. Moda is using the proceeds to benefit USA Cares. I decided to use mostly pieces from the “Because of the Brave” line, which is a Moda line inspired by Tom and Stephanie Hove. I chose that line because I wanted to make a darker, more “manly” quilt that my guild can use to donate to a male veteran during our Veteran’s Day ceremony this fall. I chose my design because I want that recipient to have lots of things to look at while he’s snuggled under it! 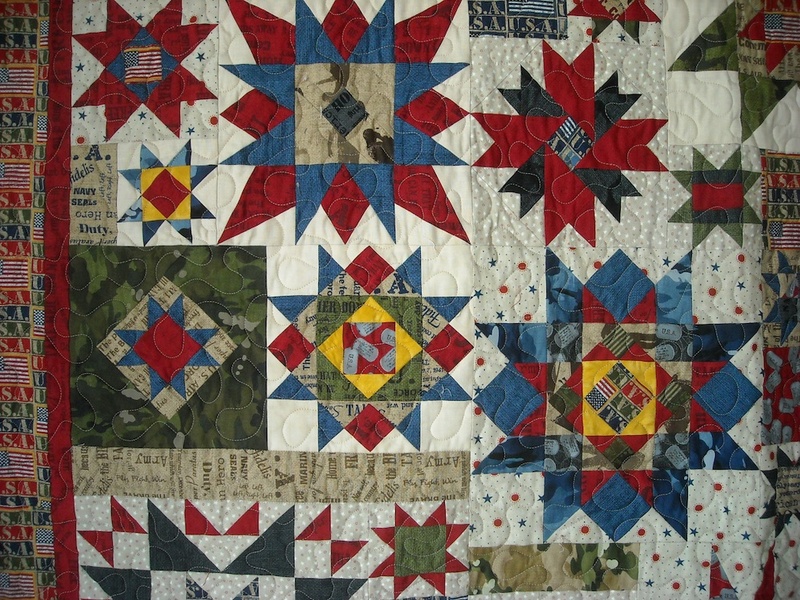 Stars of Honor won the Viewer’s Choice award at Sew Sweet Quilt Shop, then it went on to Moda’s national online Viewer’s Choice contest. I was away teaching, and didn’t even know I had won locally, or that the national voting was going on! By the time I saw it online, the voting was over. 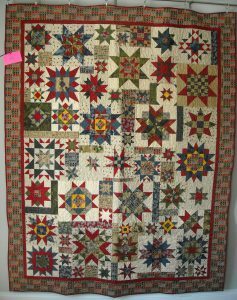 I looked at most of the quilts, and knew I wouldn’t win anything — they were all spectacular, and some of them had such sweet stories. But I got a message from Jessica at Sew Sweet that I had won Second Place overall! What a surprise! You can see all the winning quilts HERE. Stars of Honor contains 59 different star blocks, no two alike. 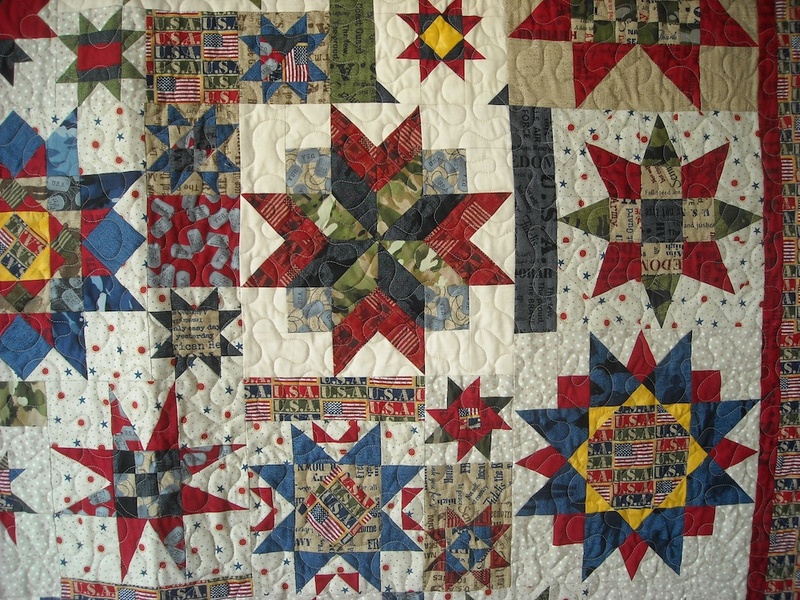 There are 4″, 6″, 8″, 9″, 10″, and 12″ blocks in the quilt, each a different pattern. Some of the 4″ patterns are repeated, but the fabrics are different in each one. There are a few filler strips of the fabrics in between in some places, just to make it all fit together. I can’t remember the exact measurements, but it’s a large throw size, almost twin-sized. 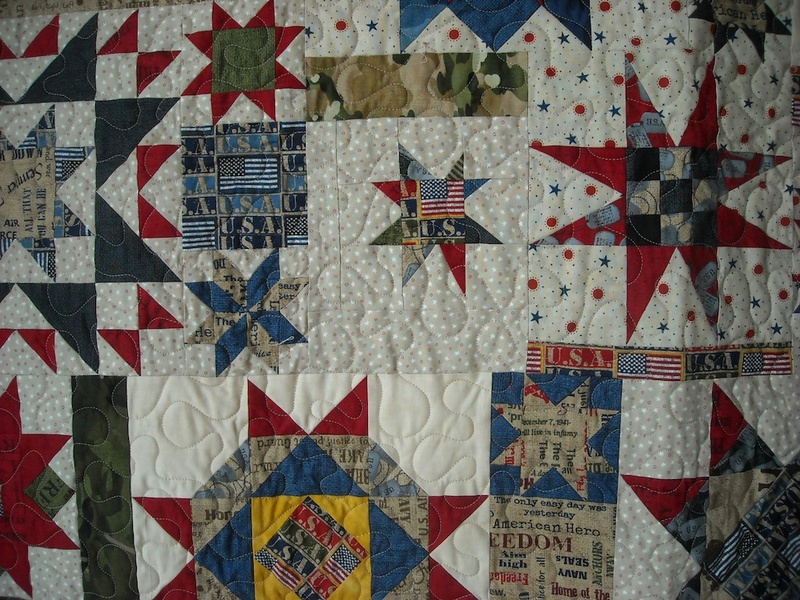 I hope the veteran that receives it this fall enjoys the quilt and truly will get peace and comfort from it. You can scroll through Moda’s blog and see all the finalists HERE. 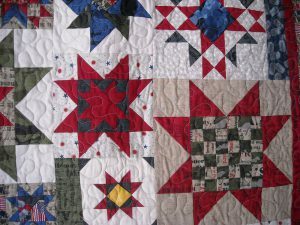 They did a separate blog post for each quilt. 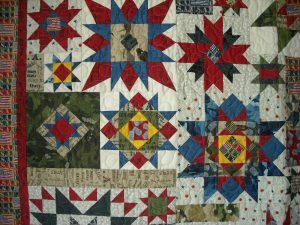 There are some wonderful quilts to see! And if you voted for me, please accept a very heartfelt thank you! Congratulations Shelly! That quilt is sew awesome! I love all those stars. You did a great job! That is so great – congrats! I think your quilt is beautiful. Your winning absolutely does not surprise me. I hope I get to see the quilt in person. Love it! Wow, Shelly! Congrats! That is one amazing, beautiful quilt! I love it and I’m sure the recipient will too! Great quilt!!!! Congrats on taking second. What a great honor. That would be a miserable pattern to write, but I would buy it, and I don’t buy patterns very often. That is a wonderful quilt! I’m not at all surprised you won prizes for it. What a terrific thing for you to do, and a beautiful design. Beautiful! I think it would have one 1st Place. Congratulations!!! Those quilts were all amazing!!! 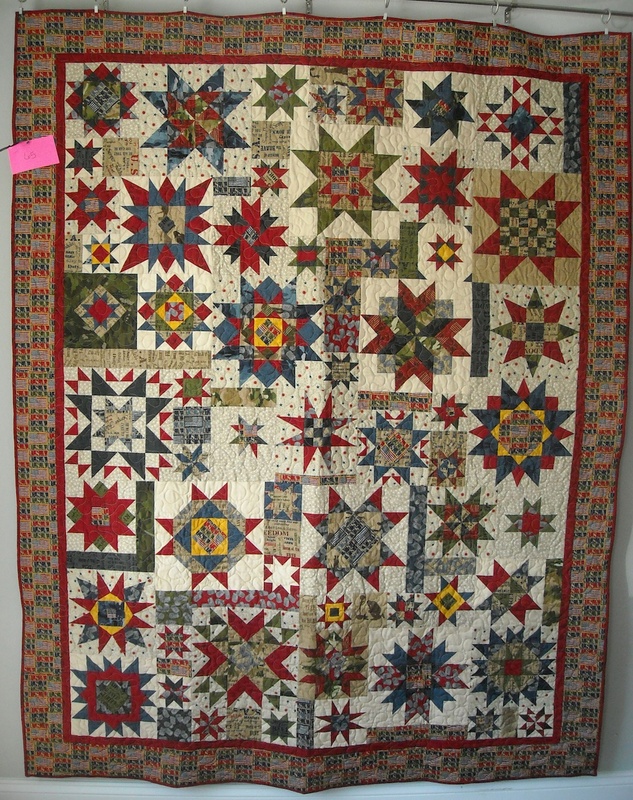 I always love a donation quilt that looks like it was made for a quilt show!! Whoever receives your quilt will be over the moon happy about it!! Beautiful quilt and for a worthy cause. Now that is a great quilt!! I did not like either collection that Moda wanted used for this challenge….all too dark… but you seem to have found some lights and made a wonderful quilt, wonderful. Now I am going back and look at the links you posted for the other quilts. Thanks.